Thanksgiving is coming at us a mile a minute. Amid all our other fall commitments, Canadian Thanksgiving seems to creep up before we know it. In Canada, thanksgiving feasts and celebrations have occurred for centuries. Many First Nations communities already had traditions of giving thanks at the end of the harvest before the Europeans arrived. Once they discovered America, Europeans also had many reasons to give thanks. During his search for the Northwest Passage, Martin Frobisher's ships got separated because of ice encounters and storms. According to Wikipedia, they found each other once again and the priest accompanying them made a sermon telling them to be especially thankful for their good fortune in such unlikely circumstances. In the 17th century French settlers who came over with Samuel de Champlain formed the Order of Good Cheer and shared their food with the Native people. After the American Revolution, British loyalists escaped north and brought their Thanksgiving customs with them. Since 1879, Canadians have celebrated Thanksgiving every year, albeit at different times. Finally in 1957, the holiday was officially set on the second Monday of October. That means we'll be celebrating in just over a week! The Flower Pot's arrangement this year incorporates the thing people were historically so thankful for: wheat! 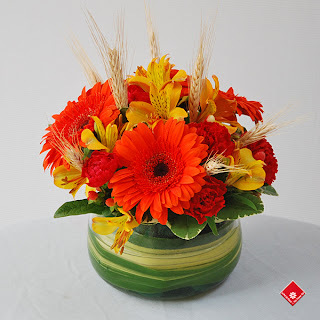 The mellow colours of the stems stick out from a vase full of oranges, yellows, reds, and greens. It makes for a truly autumnal vase and a great centrepiece for your Thanksgiving table, hence the name Thanksgiving Dinner! Check out our website, call us at 514-938-1234, or visit our lovely store at 1340 Notre Dame Ouest in Montreal. We'll be glad to see you!